Our 6 Spline and 8 Point Tuber lug nuts are designed to fir perfectly in small diameter Tuner Style wheels. They offer more gripping surface and greater torque power than regular fasteners. Available in chrome and matte black to match your wheels! 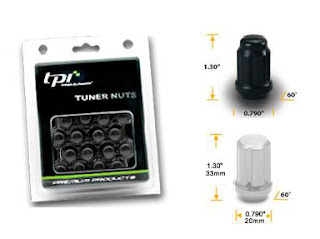 Each tuner nut clamshell set includes 20pcs nuts + 1 key. TPI's original 6-Spline Design now has a lock available. Provided with a key that is able to remove both the 6 Spline and the 5 Spline Lock is an engineering marval! All 5 Spline Locks are stamped with TPI, so the customer is guaranteed with TPI Quality and Engineering. P/S : Each clamshell includes 1 TPI Key ID Card(in case you lose the key).